It always has been a pleasure to put the spotlight on talented artists. As stated in many instances, we love unconventional art, we like discovering people who can express themselves in a unique manner. That’s why every time we receive a submission we’re thrilled to discover new talents. Matthieu Lainé is one of our latest discoveries. 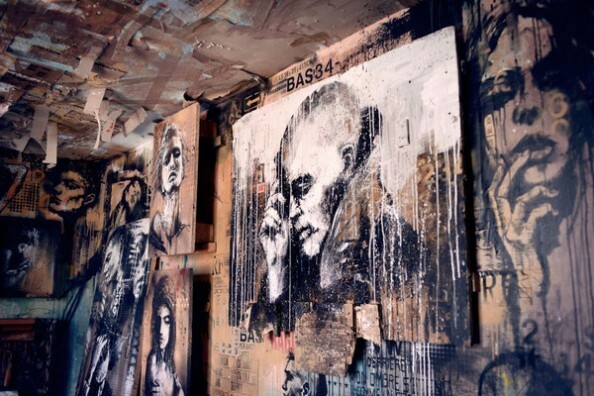 Known as GRAFFMATT, his passion for street art has developed into amazing art works. Let’s learn more about his journey and discover his work. Laura: Tell us a bit about your journey into arts. How did you discover your talent and what determined you to follow it? 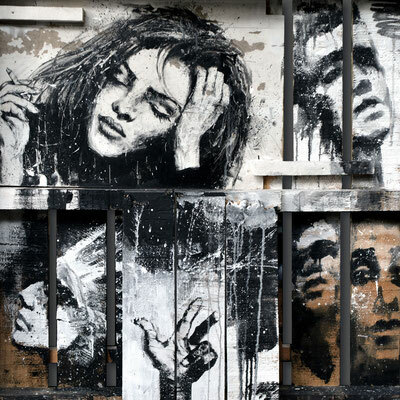 GRAFFMATT: My artist name is GRAFFMATT and I was born in the Savoie countryside (french Alps) in 1986. I started drawing as soon as I could pick up a pencil. My mum is an artist and my dad a graphic designer so there was always a lot of creativity at home when growing up. So I studied Art and I got my Associate Degree in Graphic Design in 2008. I learned a lot from it although I prefer to draw or paint rather than stare at computer all day. At this point I wasn’t sure what I wanted to do next. It seemed very hard to make a living from my art. Today I’m both graphic designer and artist but I wish to make my painting known. I’ve always been attracted by the urban world and after a while and several trips, I’ve developed an artistic technique between graffiti and drawing. My work is broken down into two steps. First, a photographic report where I focus on people in the urban scene. Then I take inspiration from my pictures to produce a painting. I’m also fascinated by the abandoned places and I practice Urbex (Urban exploration) for some time. This also explains the dark atmosphere in my paintings. Laura: It is obvious that you have a real passion for street art, do you have any specific artists you admire? GRAFFMATT: There are just too many of them to name. I like very trashy artists as Zevs or Craig “KR” Castello (this guy paints with extinguishers… respect!). In a figurative context, I also like what the duo Herakut does. Traditional painting meets graffiti and collage joins hyper-realism. 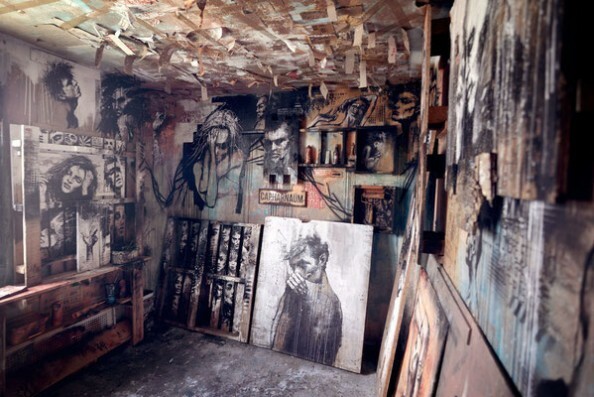 But I must confess that Guy Denning is my favorite contemporary artist. I love his sketchy lines! Laura: We saw your recent art installation. Amazing job! What’s the story behind this project? GRAFFMATT: This project could never have happened without the artistic collective which I belong to (Collectif de la Maise). In 2014, we were invited to participate in a call for proposal organized by the Art’dep association: a tower slated for demolition and enshrined by over one hundred artists from Savoy before it’s destruction. Each artist was given an apartment to create their work inside the 14-story edifice. It was a good opportunity for me to work without any restriction. No limit… I’ve been very inspired by the abandoned atmosphere of the tower. I wanted to realize a series of portraits that configure the pain of its former residents. Laura: How was it received by the public? GRAFFMATT: I think the surprise effect was successful and my apartment triggered to all sorts of reactions. Most of people were intrigued and captivated by the dark atmosphere and the variety of paintings. Others were ill at ease whereas they had just entered inside. People often asked me how long did it take to realize the installation. Admittedly, I took my time but as there was no electricity in the apartment, I had to count on the natural light. I was surprised to hear that many people were interested to buy some of my pieces. Some of them asked me if they were to wait the demolition to try to recover what remained. It was only a few months ago that I could put up for sale my paintings. Almost all my paintings have been sold. Fortunately, I immortalized this performance with my video. Laura: Share with us one of your favorite work from this project and tell us what inspired you to create it. GRAFFMATT: I don’t have one particular favorite. The accumulation of the portraits creates a special relationship between the space and the public. All the paintings form a single piece in which the viewer is immersed in the intimacy of the characters. Many different media have been used to create a gloomy atmosphere, as can be felt in an abandoned place (disused pallets, shipping cardboard, craft, acrylic and spray paint). I’m fascinated by the found objects and I take a great pleasure in using them to paint. Generally, cardboard is one of the medium I use. Besides the fact it doesn’t cost anything, the packages are so appealing and contain a wealth of information I can use them as background. By cutting them, I can build my own “canvas” in the shape that I wish. So there is less stress and and I can take much pleasure to work quickly, playing on contrasts and making a lot of paint drips! Laura: What’s next, what should we expect from you? GRAFFMATT: CAPHARNAÜM was my first street art project and I’m extremely motivated to continue down this path. Although it’s hard to make a career in art, the little time I spend on this activity has been very beneficial for me. Today I’m part of a crew and every project presents us with new opportunities to challenge each other. That is the key. You can learn more about GRAFFMATT on his website, or find him on Facebook, Twitter and all his social accounts.